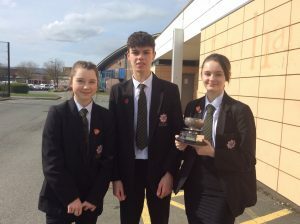 Many congratulations to the Treffynnon Youth Speaks team for achieving first place in the senior section of the Rotary Youth Speaks competition. Their presentation on “why should more money be invested in stem cell research” received huge praise from the judges. Regrettably, in the Regional final they were not winners, but to get to the last six in a region that covers all of North Wales, Merseyside, Manchester, Lancashire and Cumbria is a massive achievement. They were competing against schools from Rochdale, Penrith, Carlisle and Wimslow. The Treffynnon team in the photograph are (from the left), Mablia Kadelka-Williams who proposed a vote of thanks, Nathan Hall, the speaker, and Mia Richards, the chairperson. Flint and Holywell Rotary Club are delighted with your success. We also extend our thanks and appreciation to teacher Mrs Siobhan Henry who has coached and supported the team so well.